Sales or the past week consisted of 6 chalet sales ranging from $775,000 to $1,450,000; 7 condos ranging from $120,000 to $364,000; 5 townhouses from $580,000 to $1,225,000 and 3 parcels of vacant land ranging from $355,000 to $1,750,000. 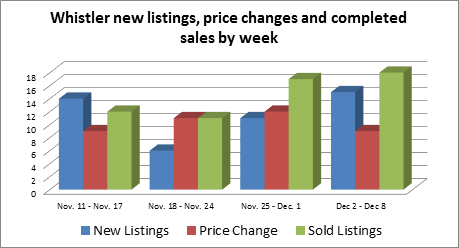 To view the past weeks new listings, price changes and sales please click here. For information on these and other Whistler real estate options, please contact me.